Local seed swaps are starting! Following are what is scheduled this month. TF&F 3rd Annual Seed Swap: Sunday, Feb. 4 from 1-3 p.m. at the Anacortes Senior Activity Center. Everyone is welcome to receive free seeds, bring seeds, or share seeds. Information tables on pollination and alternatives to pesticides will be available, as well as a raffle and prizes. Heirloom Seed Swap: 10th Annual Community Seed Exchange: Sunday, Feb. 11 from 3-5 p.m. at The Majestic, 1027 N. Forest St, Bellingham. Participants are welcome to share and receive heirloom garden seeds and edible tubers. Anyone bringing saved seed to share must label items. Meet fellow gardeners, and ask questions. Donations of seeds and money support this event. All interested in donating or volunteering should arrive early; set up begins at 1:30 p.m. For more details, contact the Volunteer Coordinator at seedswapvolunteer@gmail.com. Sponsors include: Sustainable Bellingham, Salish Seed Guild, Resilient Seeds, WWU Bee Club, Majestic Hall, Irish Eyes, Baker Creek Heirloom Seeds, Transition Whatcom, and Chuckanut Transition. 11th Annual ‘Rite of Spring’ Seed Exchange: Sunday, Feb. 25 from 2-4 p.m. Van Zandt Hall, 4106 State Route 9 in Van Zandt. Hosted by South Fork Valley Community Association and Local Food Works!, all welcome to come share seeds, plants, bulbs and gardening tips at this free, family-friendly event. No seeds to share, no problem. Community Seed Swap: Saturday, Feb. 17 from 2-5 p.m. at the Coupeville Library. Open to all gardeners of all skills. All welcome to bring seeds, plants, cuttings and garden know-how to swap and share. This free event is in partnership with local WSU Extension Master Gardeners, South Whidbey Tilth and Slow Food Whidbey Island. At 2:15 p.m., Wilbur Purdue, of Prairie Bottom Farm, will be speaking about his family’s heritage Rockwell bean, a south-end variety Kinskey Bean and a variety of Lima that has grown well for them and the importance of seed saving. Followed by Annie or Nathaniel Talbot, Deep Harvest Farm, speaking on local food systems and simple crops to begin seed saving with a Q&A. The Swap concludes with the award winning documentary movie, “Deeply Rooted” sponsored by Slow Food of Whidbey Island. Seed Saving for Gardeners with Terri Wilde, hosted by Chuckanut Center, on Saturday, Feb. 17 from 1-3 p.m. The Chuckanut Center is located at 103 Chuckanut Dr N, Bellingham. Learn the basics of saving seed from successful vegetables in your garden. Terri Wilde has been gardening and saving seed for many years and has taught in a variety of venues including the Ecology Center in Berkeley CA, Padilla Bay Interpretive Center, The Academy of Lifelong Learning and the Cascadia Skillshare Faire. Ages 13 and above are welcome. Younger children welcome with adult companion. Admission is $3-$10 sliding scale fee, payable at event only. Seed Starting For Vegetable Gardening: Saturday, March 3 at 9 a.m. at Garden Spot in Bellingham. Learn the basics of starting your vegetables from seed, indoors and out, to help you have the most successful summer harvest. 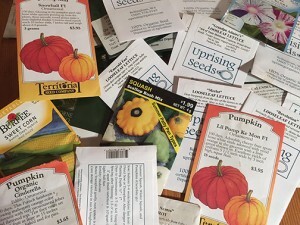 Please send your seed swap or community event information to editor@grownorthwest.com.